This premium car wash combines dense foam with powerful cleaning agents to produce a squeaky clean finish with total rinse ability. It will not harm any previously applied wax or sealant. Cars-Trucks-Trailers-Boats-Mobile Homes -RVs. Available in gallons, 5 gallons, and 55 gallons. Super thick, high sudsing concentrate is formulated to remove the toughest dirt and grime from a vehicle. Cleans automobile like a shampoo and protects like a wax, it leaves an incredible shine and beads water for weeks. WASH-N-WAX will not harm any previously applied wax sealant. 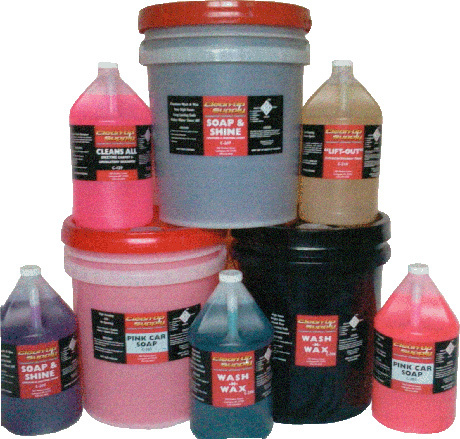 SOAP-N-SHINE is a high sudsing, pH balanced, super concentrated, car wash soap. It has excellent foaming action that clings to surface then rinses away with ease. A special sheeting agent prevents any streaking or water spots. Nice grape fragrance, . Meter Soap is formulated especially for use in cars washes. The viscosity is kept thin so it can be drawn through a metering device. Meter Soap can also be used as an economical soap by hand. High Sudsing "Super Cleaning" Great Rinsing Ability..
LIFT-OUT is a powerful combination of active cleaners and release agents. It is formulated to break down dirt & oils in carpet, upholstery, and fabric. This is a non-caustic formula designed for extractor machines at dilutions of up to 50:1. "Lifts-Out" dirty and grime for superior cleaning ability. This water activated interior general purpose cleaner penetrates stubborn dirt on fabric, vinyl, carpet, and plastic. Contains special boosters and brighteners. Super concentrated for heavy-duty cleaning. Also works as an excellent bathroom and kitchen cleaner.